The Stamp Act of 1765 was legislation passed by the British Parliament that caused enormous outcry in America until it was repealed a year later, setting in action a chain of taxes and imperial overreach that caused the Americans to revolt in 1775. The new law required that all legal documents, customs papers, commercial contracts, newspapers, almanacs, wills, pamphlets and playing cards in the American colonies be taxed. A special tax stamp was affixed to show the tax was paid; lawsuits and newspapers were hardest hit—a small matter in Britain where lawsuits and newspapers were far less common than in the colonies. The main British goal was not so much revenue as a demonstration of the supremacy of Parliament in all matters; the main American objection was not the cost, but the assertion of the supremacy of Parliament to tax Americans. Originally the British goal was to fund 10,000 soldiers in 20 battalions that were to be stationed in Canada and Indian territories—not in the American colonies. The Americans did not need the soldiers for protection—they were to be stationed outside Britain to provide prestigious officerships for British gentlemen, who could not be stationed in Britain itself because of opposition there to standing armies. At issue was not the size of the tax but the fact that no Americans had been consulted, and the colonial legislatures had been ignored. Parliament assumed it had the right to tax anything it wanted. The Stamp Act incited the first major American protest. The protests it worked, and Americans continued to protest energetically against the British imperial government in the years from 1765 to 1775; then it was time for all-out warfare. The Stamp Act outraged Americans because it asserted parliament’s right to tax Americans without their consent. That violated the rights of colonists as Englishmen. More than that: an illegal tax was an assault on property and liberty, and the two concepts were interlocked in the American mind. Property and liberty were one and inseparable, and without them life was slavery and not worth living. "Give me Liberty," cried Patrick Henry in 1775, "or give me death!" American opposition to the Stamp Act was fierce and nearly unanimous, led by the newly formed "Sons of Liberty" organizations and gave rise to the slogan "No taxation without representation." The American colonists threatened to tar and feather the tax collectors (who quickly resigned), then boycotted all British goods until the tax was repealed a year later. Crowd action ranged from enforcement of community norms to response to economic conflict within the community. Americans opposed hostile government officials, and ridiculed British "placemen" (patronage holders). At the time of the Stamp Act, crowd action was the most effective and American response. No one was killed, but American merchants and British officials were shamed and ridiculed in public. Official opposition was reflected by the Stamp Act Congress, which issued its resolutions on October 19, 1765. It rejected taxation without representation, stressed the ancient (historic) rights of the colonists as British subjects, and decided to lay the colonists' grievances directly before the British Parliament. Prime Minister George Grenville (1712–1770) designed the tax, primarily to fund 20 battalions each with 500 British troops to be stationed in America, ostensibly to protect the Americans. The garrisons were of no use to the Americans, who protected themselves from Indians and there was no foreign power that threatened. The goal was in fact to provide officer billets for sons of aristocrats who would in turn support the government. The tax was not designed to pay for the last war, as historians have sometimes said, but to make Americans pay for the future cost of the corruption of sinecures for unneeded soldiers. The 10,000 new soldiers would not be stationed in the 13 colonies at all—except for 350 they would all be in Canada or in Indian territory outside the 13. The British did not ask the American to pay for the late war, nor to pay for their own defense, Instead they demanded the Americans pay for an army that was unrelated to American needs. When the Army did ask the colonies for military help in fighting Indians in 1763, London made clear that the colonies would not be reimbursed. However the value of a large standing army that would overawe those Americans who might consider independence was apparent to London. No matter, the Crown needed the money. Grenville expected the tax would raise £60,000 of the £300,000 needed to maintain the enlarged British military establishment in Canada and the Indian territories. Amewricans would have to pay, London decided, because tax evaders would be tried not in colonial courts but in in the imperial vice-admiralty courts, which had no juries. The angry Americans immediately boycotted most English merchandise—trade fell in half. London merchants who had a large and profitable trade with the colonies were very badly hurt by the boycotts the colonists imposed, as shown by the January 17, 1766 petition of the merchants of London, reprinted below. The Rockingham ministry came to power in 1765 determined to not alienate the colonists. Parliament debated whether to send the Army to enforce the Stamp Act. Two issues were involved: collection of the stamp duties and restoration of civil authority. The Duke of Cumberland might have pressed for intervention, but his death removed the strongest advocate for such a course. Listening to Benjamin Franklin, who was agent for two colonies in London, the government finally realized the Americans would never pay up. Most of Rockingham's cabinet eventually concluded that the American resistance could not be compromised as long as the Stamp Act remained in effect and that the act itself was not worth saving, so they repealed it on March 18, 1765. The aristocrats just could not stop. When they repealed the Stamp Act they added the Declaratory Act to announce they had won the constitutional debate and that the government had "full power to make laws and statutes of sufficient force and validity to bind the colonies and people of America, subjects of the crown of Great Britain, in all cases whatsoever." The Stamp Act had been under discussion for a year before it passed, allowing the Americans time to develop their ideas before it was announced in sprint 1765. The responses were immediate and very loud. The "Sons of Liberty" were secret organizations formed in each colony to organize opposition to the Stamp Act. The name came from a phrase used in a speech against the Stamp Act in Parliament. The leaders were merchants, businessmen, lawyers, journalists, and others who would be most affected by the Stamp Act. The leaders included John Lamb and Alexander McDougall in New York, and Samuel Adams and James Otis in New England. The societies kept in touch with each other through committees of correspondence, supported the nonimportation agreement, forced the resignation of stamp distributors, and incited destruction of stamped paper and threatened violence against British officials. During the French and Indian War (1765-63), the fledgling American newspaper industry comprised only 24 papers, but it had significantly improved its methods of reporting news. Editors reprinted news and editorials from other papers, thus helping form a sort of national consensus. This made the press an effective voice in opposition to the Stamp Act—which taxed newspapers and almanacs—and in support of colonial independence soon thereafter. Benjamin Franklin had created an informal network of two dozen papers; they now acted in concert. Many circumvented the stamps by suspending publication, publishing without titles, and printing without stamps. By equating taxation without representation with despotism and tyranny, their publications helped to set the stage for the American Revolution. The newspapers reported effigy hangings and stamp master resignation speeches. Some newspapers were on the royal payroll and supported the Act, but most of the press was free and vocal. Thus William Bradford, the leading printer in Philadelphia, led the opposition to British taxes, becoming a leader of the Sons of Liberty. For many Americans the revolutionary experience could be conceptualized best within a religious framework. Sermons, orations, poems, newspapers, essays, and other sources of the popular colonial mind reveal that a significant number of Americans continued to perceive God as the prime mover in human history. They gave America's secular development a prominent place in God's moral government of the world. Because of these beliefs, the Stamp Act was viewed as a threat to the fulfillment of America's providential destiny. Americans saw the Act's repeal as a sign of Almighty intervention in support of his favored people. The Stamp Act Congress met in October, 1765, in New York City, with delegates from 9 colonies: New York, New Jersey, Rhode Island, Massachusetts, Pennsylvania, Delaware, South Carolina, Maryland, and Connecticut. It adopted the "Declaration of Rights and Grievances" (see below for text) which declared that Englishmen could not be taxed without their consent, and, since the colonists were not represented in Parliament, any tax imposed on them without the consent of their colonial legislatures was unconstitutional. Between January and November 1765, the New Hampshire Provincial Assembly moved from indifference to the intensifying dispute between London and the American colonies to wholehearted endorsement of the colonial resistance. Three events created a climate of change: the exposure of Benning Wentworth's corruption, the Sugar Act, and the transmission of Whig views from other colonies through the press. These events led to a broadly based popular movement against the Stamp Act-based not on economics but on the defense of liberty. Lawyer James Otis (1725–83), in his speeches and pamphlets, defined and defended colonial rights. He popularized the cry, "No taxation without representation!" Otis proposed and participated in the Stamp Act Congress, and his ideas were used in the protests drafted by that body. Josiah Quincy (1744–75), an outstanding lawyer, wrote a series of anonymous articles for the Boston Gazette in which he articulated the legal grounds for opposing the Stamp Act. Andrew Oliver (1706–74) was a colonial politician; his acceptance of the post of stamp officer after the passage of the Stamp Act led to violent demonstrations against him, which forced him to resign the office. John Hancock (1737–93) inherited Boston's leading mercantile firm, and strenuously opposed the Stamp Act and other British trade restrictions. In 1768 his ship Liberty was seized as a smuggler and confiscated by the crown. A riot ensued, and later the ship was burned. Hancock was hailed as a martyr and elected (1766) to the legislature, where he joined Samuel Adams in advocating resistance to British tyranny. Thomas Hutchinson (1711–80), was a leading politician who privately considered the Stamp Act and other government measures unwise. Nevertheless, he demanded favored strict enforcement, and his unpopularity caused a mob to loot and burn his mansion in 1765. He became royal governor in 1771 and was determined to suppress signs of rebellion. Rhode Island's political and merchant elite organized and manipulated working-class rioters to put pressure on the British in their commercial conflict with the colonies. But the rioters had their own motives as well. of Newport, Rhode Island. Like the merchants, they gave vent to concerns about constitutional issues. They also rioted in response to hardships brought on by economic depression, dislike for the British policy of impressment of civilians into the Royal Navy, and resentment toward Newport Junto loyalists who belittled the political importance and self-esteem of commoners. Rhode Island Governor Stephen Hopkins took the lead against the Sugar Act of 1764, invited other colonies to join in the Stamp Act Congress of 1765, and was a delegate to the First Continental Congress of 1774. In Pennsylvania the Proprietary Party, fearful of loss of charter rights, instigated riots to discredit Benjamin Franklin's Quaker Party, which favored the Crown's taking over the colony. The Proprietary Party specialized in libel; the Assembly Party, politics. In the election of October 1765, the loss of seats by the Proprietary Party demonstrated that the electorate favored moderate resistance to the Stamp Act enforcement. Joseph Galloway played a conciliatory role and did not let the conflict get out of hand. The central political role of Philadelphia merchants reached a peak with their successful Stamp Act protests in 1765. By 1768 during the Townshend Acts protests, the wealthier merchants refused to sign agreements concerning the nonimportation of British goods. By 1770, the city’s artisans and radicals became more important to the resistance than merchants. With the Tea Act of 1774, more merchants united with the radicals to revive the languishing revolutionary movement. Although the radicals later succeeded in forcing the break with Britain in 1776, the merchants stepped in to manage the new governments. In Virginia lawyer and radical democrat John Mercer's (1705–68) took the lead in opposing the new tax. Mercer heard of the law's passage in April 1765 and immediately published a list of taxed items and rates, prefaced by an incendiary introduction. Mercer's argument against the act was echoed by colonial courts in November, when the law became effective. Citing Chapter 40 of the Magna Carta, which states that legal process may not be sold, Mercer's early protest of the act probably contributed to the passage of the Virginia Resolves in May 1765, which in turn led to similar actions in other colonial legislatures. Richard Henry Lee (1732–94) was the leader in the formation of a nonimportation organization, which successfully called for Americans to boycott imports of all British goods. Patrick Henry (1736–99) in the Virginia House of Burgesses denounced the measure in a speech that has become famous. George the Third--[here tradition has it that the House Speaker interrupted with a shout of 'Treason!' but Henry continued] may profit by their example. If this be treason, make the most of it." The speech helped persuade the Virginia House of Burgesses to adopt in May, 1765, the Virginia Resolves against the Stamp Act: not only did Henry deliver the famous Caesar-Brutus speech; he wrote the Resolves, planned with George Johnston the strategies for debate on the house floor, and spoke at several points in the debate which initiated colonial resistance to the Act, resistance which culminated in the Act's repeal in 1766. The lack of firm police action by the North Carolina royal government against patriots demonstrating their opposition to the Stamp Act in 1766 suggests that weak law enforcement encouraged anti-British activity during the pre-Revolutionary period. Governor William Tryon could not enforce the Stamp Act regulations in the Wilmington area owing to several acts of civil disobedience, including disruption of his inauguration. Law enforcement officers often supported these disturbances themselves or lacked the means to quell them. The precedent for future opposition to new taxes was set. A powerful royal governor assured compliance with the next tax—of the 13 colonies only Georgia paid the stamp tax. The Stamp Act produced widespread public criticism in remote, underpopulated West Florida. However, Governor George Johnstone vigorously enforced the Act and serious opposition failed to materialize, chiefly because of the scattered population and primitive economic conditions. The two British colonies of West Florida and East Florida did not join the other 13 colonies in 1776; they remained loyal. In 1783 Britain gave the two colonies to Spain and the British living there were expelled. Eventually the U.S. purchased the two colonies from Spain in 1819. Stamp shows patriot citizens rallying around the Liberty Tree. 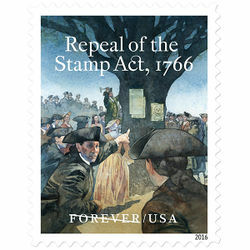 On the 250th anniversary of the repeal of the Stamp Act, the United States Postal Service issued a stamp commemorating the event. Bullion, John L. A Great and Necessary Measure: George Grenville and the Genesis of the Stamp Act, 1763-1765. (1982). 290 pp. Resolved, That the first Adventurers and Settlers of this his Majesty's Colony and Dominion of Virginia brought with them, and transmitted to their Posterity, and all other his Majesty's Subjects since inhabiting in this his Majesty's said Colony, all the Liberties, Privileges, Franchises, and Immunities, that have at any Time been held, enjoyed, and possessed, by the people of Great Britain. Resolved, That his Majesty's liege People of this his most ancient and loyal Colony have without Interruption enjoyed the inestimable Right of being governed by such Laws, respecting their internal Polity and Taxation, as are derived from their own Consent, with the Approbation of their Sovereign, or his Substitute; and that the same hath never been forfeited or yielded up, but hath been constantly recognized by the Kings and People of Great Britain. January 17, 1766. A petition of the merchants of London, trading to North America, was presented to the House, and read; setting forth;"
"That the petitioners have been long concerned in carrying on the trade between this country and the British colonies on the continent of North America; and that they have annually exported very large quantities of British manufactures, consisting of woollen goods of all kinds, cottons, linens, hardware, shoes, household furniture, and almost without exception of every other species of goods manufactured in these kingdoms, besides other articles imported from abroad, chiefly purchased with our manufactures and with the produce of our colonies; by all which, many thousand manufacturers, seamen and labourers, have been employed, to the very great and increasing benefit of this nation; and that, in return for these exports, the petitioners have received from the colonies, rice, indigo, tobacco, naval stores, oil, whale fins, furs, and lately potash, with other commodities, besides remittances by bills of exchange and bullion, obtained by the colonists in payment for articles of their produce, not required for the British market, and therefore exported to other places; and that, from the nature of this trade, consisting of British manufactures exported, and of the import of raw materials from America, many of them used in our manufactures, and all of them tending to lessen our dependence on neighbouring states, it must be deemed of the highest importance in the commercial system of this nation; and that this commerce, so beneficial to the state, and so necessary for the support of multitudes, now lies under such difficulties and discouragement, that nothing less than its utter ruin is apprehended, without the immediate interposition of parliament; and that, in consequence of the trade between the colonies and the mother country, as established and as permitted for many years, and of the experience which the petitioners have had of the readiness of the Americans to make their just remittances to the utmost of their real ability, they have been induced to make and venture such large exportations of British manufactures, as to leave the colonies indebted to the merchants of Great Britain in the sum of several millions sterling; and that at this time the colonists, when pressed for payment, appeal to past experience, in proof of their willingness; but declare it is not in their power, at present, to make good their engagements, alleging, that the taxes and restrictions laid upon them, and the extension of the jurisdiction of v ice admiralty courts established by an act passed in the fourth year of his present Majesty, for granting certain duties in the British colonies and plantations in America, and by an act passed in the fifth year of his present Majesty, for granting and applying certain stamp duties, and other duties, in the British colonies and plantations in America, with several regulations and restraints, which, if founded in acts of parliament for defined purposes, are represented to have been extended in such a manner as to disturb legal commerce and harass the fair trader, have so far interrupted the usual and former most fruitful branches of their commerce, restrained the sale of their produce, thrown the state of the several provinces into confusion, and brought on so great a number of actual bankruptcies, that the former opportunities and means of remittances and payments are utterly lost and taken from them; and that the petitioners are, by these unhappy events, reduced to the necessity of applying to the Ho use, in order to secure themselves and their families from impending ruin; to prevent a multitude of manufacturers from becoming a burthen to the community, or else seeking their bread in other countries, to the irretrievable loss of this kingdom; and to preserve the strength of this nation entire, its commerce flourishing, the revenues increasing, our navigation, the bulwark of the kingdom, in a state of growth and extension, and the colonies, from inclination, duty, and interest, firmly attached to th e mother country; and therefore praying the consideration of the premises, and entreating such relief, as to the House shall seem expedient." ↑ Fred Anderson, Crucible of War: The Seven Years' War and the Fate of Empire in British North America, 1754-1766 (2000) p. 561-2 online. Only 350 soldiers were needed to control the Indians in the west. Ibid. p 636. ↑ George Louis Beer, British Colonial Policy, 1754-1765 (1922), pp 263, 266. online at Questia. In 1755, William Shirley, the royal governor of Massachusetts told officials in London that American independence could easily be frustrated. He explained that "At all Events, they could not maintain such an Independency, without a Strong Naval Force, which it must forever be in the Power of Great Britain to hinder them from having: And whilst His Majesty hath 7000 Troops kept up within them, & in the Great Lakes upon the back of six of them, with the Indians at Command, it seems very easy, provided the Governors & principal Civil Officers are Independent of the Assemblies for their Subsistence, & commonly Vigilant, to prevent any Steps of that kind from being taken." Beer p. 266. A strong, visible military force did keep the potential rebels quiet in Nova Scotia in 1775, and that colony never joined the Revolution. ↑ John L. Bullion, "British Ministers and American Resistance to the Stamp Act, October–December 1765." William and Mary Quarterly 1992 49(1): 89-107. ↑ That is, Brutus had assassinated Julius Caesar, and Oliver Cromwell had executed the English King Charles I. A threat to the life of the king was the worst kind of treason, with the penalty of being hanged, drawn and quartered. This page was last modified on 9 April 2019, at 16:53.